Design analysis employ methods to simulate the physical behaviour of a product design. At SAMKRG, our engineers analyze every possible product development and research effort imaginable. Our modern and up-to-date simulation methods help us immensely in developing world-class pistons and piston rings for our domestic and overseas customers. Computer-aided engineering and simulation creates a flawless product as it helps in eliminating problems before the actual production begins. Design simulation analysis helps us in testing the safety and pre-effectiveness of the product which in turn helps in removing unnecessary cost. It eventually allows us in creating a product as per our customer’s expectations. The design simulation and analysis helps in figuring out the enormous strength to withstand the high pressure. It also lets us know the minimum weight required to withstand the inertia forces. 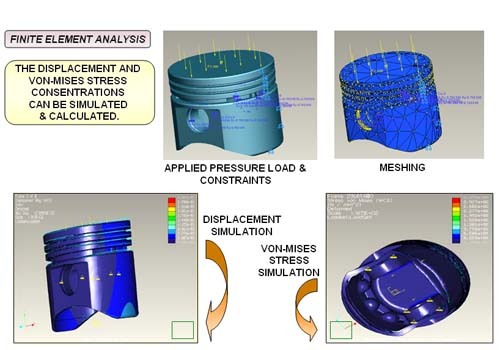 The simulation also helps in determining the sufficient bearing area required to prevent undue wear and tear. It helps you determine the high-speed reciprocation without noise and the sufficient rigid construction required to withstand thermal and mechanical distortions. Also, it gives sufficient support to the pin. All of these are of immense help in manufacturing the right kind of pistons and piston rings for vehicles of every kind.